The list of foods that pregnant woman are told not to eat is both longer and more surprising than anyone expects. Off-limit foods include raw sushi, deli turkey, sprouts and certain cheeses -- including blue cheese. 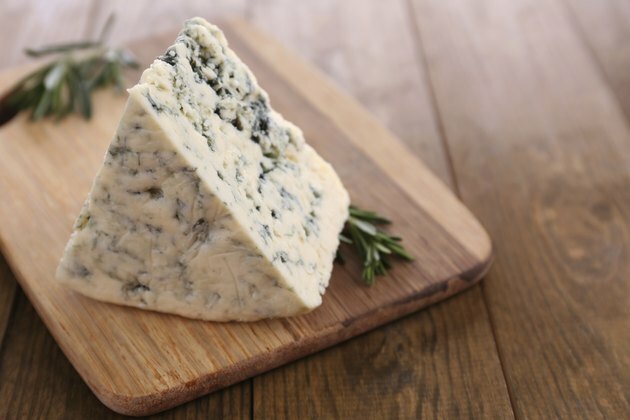 The restriction is due to the risk of listeria, a bacteria found in contaminated foods; however, the risk is greatly reduced if the blue cheese is made from pasteurized milk. At some point in your pregnancy, your doctor will give you a list of foods you should avoid eating, and you shouldn’t be surprised to find soft cheeses on that list. The Centers for the Disease Control and Prevention recommends that pregnant woman avoid unpasteurized soft cheeses, including feta, Brie, Camembert and blue-veined cheeses. However, you can safely eat pasteurized versions, as well as hard cheeses such as Parmesan, semi-soft cheeses such as mozzarella and pasteurized processed cheese slides and spreads such as cream cheese. If you’re a blue cheese aficionado, it’s difficult to give it up for the 40 weeks of pregnancy. However, unpasteurized cheeses during pregnancy aren’t something to risk. A report from the CDC that spans 1993 to 2006, found 122 foodborne disease outbreaks caused by contaminated dairy products; in 60 percent of those outbreaks, the product wasn’t pasteurized. Unpasteurized blue cheese carries the risk of the bacteria listeria, as do other unpasteurized dairy products, uncooked meats and vegetables and processed foods such as deli meats. The bacteria are killed by pasteurizing or cooking the food, which is why unpasteurized blue cheese is not safe for a pregnant woman. Pregnant women are 20 times more likely to become infected with listeria than non-pregnant healthy adults, with the total number of cases of listeriosis around 17 percent, according to the American Pregnancy Association. Symptoms of listeriosis include mild, flu-like symptoms, nausea, headaches, fever and muscle aches. Infection is most common during the third trimester when your immune system is suppressed. Serious complications of the infection can include miscarriage, premature delivery and infection to the newborn. It's easy to tell if your favorite type of blue cheese is pasteurized -- simply look at the ingredient list. If the label doesn't clearly say that it's made from pasteurized milk or if it states that raw milk is one of the ingredients, put it back on the shelf. You can reduce the risk of listeria in foods, including cheese, by storing them safely in the fridge before consuming.